any ideas where I can talk about? What are the most important things in the COC? Start out by playing a lahn to get their attention! It'll start off the mood as an ancient church and bring them back to old times. You could play a recording (in case you don't have the guts to sing) of a priest part then a chorus of deacons responding or something. If you do Pek-ethronos, you will go into overtime (O.T.). language in the introduction. Where can I find more info about it, not too difficult? But what shall i tell/explain about the la7n? (give me a nice la7n ;) And where can i find info about it? 2. The history of the coptic orthodox church... to begin with...saint Mark? 3 Where we believe in? The holy trinity and ...............................what else? -martyrs? (Old and new martyrs? The difference of 1000 years ago and now? Abouna Tadros Malty wrote a book on Intro to Coptic Church. I used it as a source in my speech. It's online somewhere.. I'll look for it. oh, the link doesnt work, but never mind thanks for ur effort! Here is book that TITL is talking about. I really love the orthodoxebooks website. They have like every book. God bless their efforts. About the hymn, I found a good one by David ensemble. Wow, that's a amazing site! Thank u very much! As about the eyecontact, I will try :p I don't think it will be difficult cause I am NOT allowed to cheat from a piece paper, so I have to learn everything in correct english out of my head, omg! shall I tell about the martyrs? Sorry I didn't incorporate the link like I said I would. I forgot. Please refer to the topic "Staying Focused". Thank you Joe and ebnyasoo! God be with you tomorrow (today technically)! As Tony the tiger would say: You'll do Gr-r-reaat!!!! thaankkkss :) but it was not today, it is im Januari ;) Today I only gave her my points of disccusion. So I am trying now to list the most important things that I have to tell in my oral exam. to turn on another point) but now I am REALLY confused about WHAT exactly is nessecary to tell?? The conversation is with my teacher...and it's about 15/20 minutes..
church but not that much, it's not enough and like in a way to tell her, that a not-christian at least UNDERSTAND what I am talking about.. The links some of u gave me are very useful, and I am reading now a part of " introduction to the c.o.c" - Fr. Tadros Y. Malaty. ": http://books.google.com/books/p/pub-9632288571543958?id=TrhLRZmCqX8C&pg=PA356&dq=introduction+to+the+coptic&ei=fwAATdCnFI38M5jkpJ4P&cd=1#v=onepage&q&f=false but I want a select from the MOST useful information in a ordered way to prevent confusion. 2- The establishment of the C.O.C. page 8 from " Introduction to the coptic chruch (Fr tadros Malaty). But is that everything is should say about that? brought the christian faith to Egypt?? Should I tell about the bible: " Blessed is my folk Egypt??" 4. Should I tell about the Holy liturgy? If the answer is Yes, what should I tell? The Holy communion...and..
5. What should I tell about the dogma's?? Further, should I tell about Saint Virgin Mary? Saints? Martyrs? What should I tell about it? The bible? Prayer? Fasting? 4. To let my non-christian teacher know about our church and give her and others a CoRrect image of our faith. You pronounce "Aigyptos" as "ah-gib-toos". Yes, I think I think that's all you have to say about that word. Orthodox mean straight path. You could say we're the only religion that hasn't derived from the truth. All our practices now (liturgy, sacraments) were handed down from the apostles, and since then we have not changed. You could also say one of the liturgies we use now (St. Cyril I believe) was written by St. Mark the Apostle, who preached Christianity in Egypt and built and was Pope over our first church, which still exists in Alexandria. I also don't understand the Trinity. So I'll let someone else explain that, but I don't think that's right (about the properties) The Holy Spirit, Son, and Father don't "describe" God, He is God. Heat is not fire, but fire is heat. So it's not the same... I don't see why you have to incorporate that into your speech? You should definitely talk about the liturgy! We have 3: St. Basil, St. Gregory, and St. Cyril. Theres A LOT you can say about that. Do some research on suscopts.org and I believe Abouna Tadros Malaty talks about it too in his book. Chapter 7 has a brief explanation on the dogmas, but I would just talk about the sacraments, saints, church traditions, and possibly our differences with other Christians churches (protestants and catholics) on the trinity. 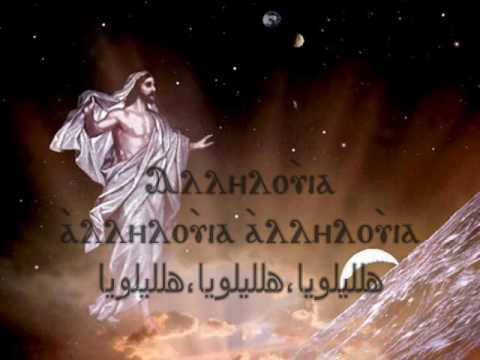 you don't have to get too deep since you only have 15 minutes, so just say Copts believe The third person of the Trinity, proceeding from the Father alone as in the original Nicene Creed. That the Father sends the Spirit at the intercession of the Son, however the Protestants and Catholics believe that The Holy spirit proceeds from both the Father and the Son. And thats the main reason why we're not in communion with them. ALso mention the 2 branches of Orthodoxy: Eastern and Oriental. I don't remember the list on the top of my head but Oriental consists of Coptic, Eritrian, Ethiopian, British, Russian and Eastern has Greek and a few others lol. Search the forum, people have mentioned the list quite a few times on here. You can talk about the fasts when mentioning the dogmas (under church traditions). Again, just be brief. 15 minutes will go by reaaally fast! I would suggest that you only speak about those things you feel confident you understand and can explain. It would be better to try and say less and say it well than say too much and get confused. "Assume a garden with multiple kinds of trees as follows: some of the trees are natural growing from their roots in the soil. Others are artificial without roots, planted for beatification. Some of the later trees having branches but without roots. Other are made of a kind plastic material. In the midst of all these kind of trees, there is only one true vine tree. In this assumed garden, how can you know the real tree and its qualities? Or in other words, how does the real tree reveal itself? The tree should have its own way to reveal itself that we can know it and its qualities. Not only the tree, but also every existing matter has its own way to manifest itself. If you consider the sun, we can say it exists because it reveals itself by itself by its own things that expresses its existence, which are: The star that is called the sun. The light, or the rays begotten from the star. The heat proceeds from the star trough its rays. By these three essential things, the sun declares its existence and its effects. In the mean time, these three things are of the one sun and are of the same quality of the sun. If these three things of the sun were not there, we would say the sun is a mere idea and its not there. Likewise, we hear and read about the existence of God and his omnipresence. But these truths would be mere ideas or even doubtful beliefs, until God reveals himself. God has his own way to manifest himself and this is a main issue of what the Holy Trinity is all about. By knowing the Holy Trinity, we can say, God exists. He manifests himself in an unique way." the Holy trinity. Like the Son gives light, heat and ..fire? IS THIS THE RIGHT(short) ANSWER, does anyone know? I think the most important thing is to let her know about our faith, and maybe she will be interested and tell around..
(altough, maybe it will be just a dream to convince her, who am I to convince others, haha..). is the same as what Fr. Abraam said in his book.. Personally, I don't think that you need to discuss the doctrine of the Trinity very much, not least because you will not feel confident. It is perhaps enough to say that Orthodox Christians believe that God is not one Divine person, all alone from eternity, but God, who is love, is a community of three Divine Persons who are the same God. God is love, and so the Father has always begotten His Son who is loved by Him and loves Him in return. But the love of only two people is inward looking, while God in his eternal love is always generous and self-giving, and so there is a third Divine Person, the Holy Spirit, who is also the same God, and who proceeds from the Father, and is embraced in the love of the Father and the Son. This trinity of loving Persons is one God. There are not three Gods. But it is impossible to think of God as love without understanding that within the being of God there are three Persons who love and are loved from all eternity and beyond all time. God on his own is not love. The love of God teaches us the Holy Trinity. Each of them share the same Divine being, so they are equally omniscient, omnipotent, and eternal. All that distinguishes them - because as humans we cannot begin to define God - is that they are three Persons, the Father, the Son, and the Holy Spirit. Okay, thank you Fr. Peter and a happy new year. Doesn't orthodox means ' straight' ? The definition of Orthodoxy can be found within the roots of its name. One of the roots of the name "Orthodoxy" is taken from the Greek word which means "opinion, teaching." It can also mean "glory." Therefore, Orthodoxy means the "proper method of rendering glory, right worship, and consequently the right way of teaching about the One to whom the glory is rendered." So what is it?? Straight? Opinion? Or Glory? What a word means is not always the same as a strict etymology. Orthodoxy can be taken to mean 'right belief or opinion'. Lots of English words, for instance, derive from very ancient words, but that doesn't necessarily define what it means. What do WE mean by Orthodoxy? That is what it means. And we mean 'right belief or opinion'. There is no need to go to the very most ancient roots of a word. Merci Fr. Peter, God bless you. I will show u what I made of it, could anyone pleaseeeeeeeeeeeeee control it and correct things if there are things not correct and eventually replace diificults words in easier words? You don't have to do a lot if u don't have much time, jus try..Is this enough for 15/20 minutes?? Personally I think it's too much but I don't know what to let away, because I think everything is important, and I love the part of the martyrdom so I dont want to delete things from there. Explanation of the term “Coptic Orthodox”. So my topic is “The Coptic Orthodox Church” . Most people if I ask them if they know what kind of church it is, they say “no’ and look at me if I am insane, so I think it’s a good idea if I first am going to explain about the term “Coptic Orthodox” . “Coptic” means Egyptian, and in Greek it loud:” Aigyptos” and most Christians living in Egypt identify themselves as Coptic Christians. As a denomination they originated in the city of Alexandria, one of the most faithful, respected, and fruitful cities during the Apostolic period. Proudly, the Coptic Christians acknowledge and herald Saint Mark, (author of the Gospel of Mark), as their founder and first bishop sometime between A.D. 42 - A.D. 62. The Coptic church was actually the very first major split in the Church, well before there was such a thing as "Roman" Catholicism, and it was also well before the East/West split. Orthodox mean straight path. You could say we're the only religion that hasn't derived from the truth. All our practices now (liturgy, sacraments) were handed down from the apostles, and since then we have not changed. How was Christianity introduced into Egypt? The Coptic Orthodox Church is of the oldest known Churches in Christianity. Its Biblical worship, its 2000 years of Christianity, and unbroken chain of tradition directly link its faithful to the early church of the Book of Acts in the New Testament. The Coptic Orthodox Church has millions of adherents both in Egypt and Coptic communities around the world. St. Mark is considered the founder of the Coptic Church. The Copts are proud of the apostolicity of their church, whose founder is St. Mark; one of the seventy Apostles (Mark 10:10), and one of the four Evangelists. He is regarded by the Coptic hierarchy as the first of their unbroken 177 Patriarchs, and also the first of a stream of Egyptians martyrs. St. Mark was an African native of Jewish parents who belonged to the Levites’ tribe. His family lived in Cyrenaica until they were attacked by some barbarians, and lost their property. Consequently, they moved to Jerusalem with their child John Mark (Acts 12:12, 25; 15:37). Apparently , he was given a good education and became conversant in both Greek and Latin in addition to Hebrew. His family was highly religious and in close relationship with the Lord Jesus. His Mother, Mary, played an important part in the early days of the church in Jerusalem. Her upper-room became the first Christian church in the world where the Lord himself instituted the Holy Eucharist (Mark 14:12-26). 1) He begins his Gospel by describing John the Batpist as a lioan roaring in the desert (Mark 1:3). 2) His famous story with the lion: Once a lion an lioness appeared to John Mark and his father Arostalis while they were travelling in the Jordan. The father was very afraid and begged his son to escape while he awaited to his fate, but St. Mark was not afraid because of hi strong faith and he was assured that Jesus Christ would save them, so he began to pray and as a result of this prayer, the two beasts fell dead. The father who first didn’t believe in Jesus believed after what happened and died shortly thereafter. What do the Copts believe in? We believe that God is love (John 4:8) We believe that God is not an idea, just to find a statement of the existence of the world, or a supreme far away from us, no we really believe that God is our Father and the Lover of mankind. In the Nicene Creed which we pray from the Agpeya is exactly told what we believe in and it is made by St. Athanasius the 20th Pope of Alexandria. (We believe in one God, God the Father the one who created heaven and earth, and all things seen and unseen.) The essential doctrines of the church are: there is one God, the Creator of Heaven and Earth; we believe in the Holy Trinity which consists of God the Father, God the Son, and God the Spirit; and all three are one God. For many people it is difficult to understand the Holy trinity which says that we believe in one God and not in three Gods. Not only nun-copts, but also copts self. A human’s brain is limited. Although we accept many phenomenon’s in this world, also the things which can’t be seen, because we simply know that it exists. Every human believes that he has a soul. We don’t see it, but despite of this we accept it.. Why? Because not everything in the world can be explained with science. Even the greatest scientists are until nowadays unable to explain everything. Some people thinks that our faith is monotheistic, but that’s absolutely not true and that’s shortly to explain with an example. Let’s take the example of fire. Fire consists of three elements: heat, fire and light. It are 3 elements, but it is 1 thing. Another example is the human. An human exists of a body, a soul and spirit. Me, by example, I have those three things, but I am still one person and not three. That’s exactly the same thing of the Holy trinity: The Father and the son and the Holy Spirit are one God. We also believe that God the Son was incarnate through the Holy Spirit and took human form in the womb of the Virgin Mary, was born, crucified, and resurrected on the third day for the salvation of mankind. We believe that there are seven sacraments, which are vital for the relationship between God and man, which are: Baptism, Confirmation, Holy Communion, Marriage, Priesthood, Confession and Anointing of the Sick. About the Holy communion, we believe that the Mass places us in communion with God through the consecrated bread and wine. We believe in the resurrection of the dead, final judgment and eternal life. The fundamental basis of our entire faith is the Holy Bible which consists of the Old and New Testament. Further we believe that the Holy Virgin Mary is the mother of God. The word, Agpeya, is a Coptic (ancient Egyptian) word meaning “Book of Hours.” It is based on the Coptic root word, ti agp, which means “hour.”The Agpeya is primarily used by the Coptic Orthodox Church. It contains prayers for seven different hours to be said throughout the day. The hours are chronologically laid out, each containing a theme corresponding to events in the life of our Lord Jesus Christ. In the Epistle to the Hebrews, this word means "the service of the altar," or "the priestly service" Heb. 8:6; 9:21. We have three Liturgies: St. Basil, St. Gregory, and St. Cyril. Saint Mark is the first one who made the liturgy, but St Cyril completed it and wrote it. The three liturgies are a bit different in the words. The church used this term since the apostolic age, to cover all that worship which is officially organized by her, and which is offered by all her members, or on their behalf. In the course of time, this term has come to be particularly applied to the performance of the service of Eucharist. The Coptic liturgies are known to be not monopolized by clergymen. They are the liturgies of all the church. The people participate in the hymns, and prayers. Therefore clergy men should pray in the language of the people, clearly and with a pleasant tone, as the people take their turn in participating. And the liturgy is being prayed in a singing tune. Here the "people" means all the people: men, women and children. The Coptic Church does not exclude children during the liturgy, and this is one of the resources of our church in Egypt, for even the child feels his positive membership and acknowledges his right in participating in church liturgies. The beautiful rites and heavenly hymns encourage children in worship without feeling bored, In spite of the lengthy services. The Liturgy is about 3 hours, but in our church in Amsterdam North we have 2 liturgies, one for children and one for adults, because the Liturgy of the children ends earlier so they can go to the sundayschool after it. Our church is also called the church of the martyrs, because since the beginning of our the Coptic church there have been every day Christians suffering for the Sake of our faith. Martyrdom is the story of Christianity from its beginning. It is a story of spreading the Holy Gospel all over the world. The witness of the martyr’s blood was greater than any teaching or preaching. Martyrdom is a deep philosophy founded on strong spiritual principles for which Christian from all social levels, and throughout the ages have been attached to. The Coptic Church has faced discriminations and hardships of all kinds, including active persecutions. Yet, the Church has thrived and the traditions have survived in these often-unfriendly environments. The vast and innumerable martyrs are a testimony to the Coptic Orthodox followers' unshakable faith. This persecution began in 64 AD and in the 10th year of his reign. The most famous persecution is the last one, the one from emperor Diocletian. So many martyrs faced persecution during Emperor Diocletian’s reign. His persecution was not limited to anyone. Christians with high ranks, females, old men and even young children such as St. Abanoub and St. Rebecca with her 5 children. Diocletian’s persecution covered his entire empire, Egypt at this time as part of the Roman Empire at that time. Persecution on the Christians increased their faith in God. Also lots of idol worshipers believed in Christ as they saw one of these martyrs enduring the pain for the sake of Christ. For example, thousands of people believed in Christ as they saw St. George’s endurance and miracles during his persecution by Diocletian. All of that made the church stronger. So until nowadays are Coptic Christians being persecuted. Even if it is ‘modern’ persecution, maybe not with a sword, but with a bum or a gun, it’s still persecution. A good example is the attack on copts in Alexandria in Egypt 2 weeks ago at New Year’s evening where 23 people died and at least 80 injured people. The government does nothing to protect Christians in Egypt. Only 15 or 20 percent of the Egyptian population is Copt. Even the police self helps with the murder on copts. And they don’t stop! Three days ago a policemen shoot on a couple of Christians in a train which was travelling to Cairo from Menya. 1 Copt is killed and other five were injured. And like they mostly say, also this time they say that this men was mentally sick and that he just shoot random, not purpose. I strongly disagree with this rubbish. This is not the first time what happened to Christians. Last year at Christmas evening were also 6 copts killed in Naga7amadi (they were young boys) . And every month the trial has been delayed, until now it's delayed until next sunday! Already more than a year now passed and the murderers are not been judged yet. So as you can see, Coptic persecution will never end, there will be always martyrs who die for Christ’s sake. We, as Christians are not supposed to attack back or do the same what they do, we are not going to reduce to their level, because we , Christians have learned that we must love our enemies. I am not saying that I agree with they are doing, absolutely not. Mothers are crying about her children, families, friends. Even in my chuch there are people who lost their loved ones. It is disgusting, but we trust on God that he will give us power and hope. I think that sounds good. Congratulations. You have about 2150 words so that will be pushing the limit of 20 minutes. There are a few little things. You mean St Mark's Biography, not his Bibliography. You have used the word bum instead of bomb.